What makes System 800xA 'Extended Automation'? With System 800xA, users enjoy a fully integrated enterprise where PLCs, DCS systems, safety systems, electrical systems, live video, maintenance systems, ERPs and more all work together in an seamless environment. The result is improved plant visibility and fast access to relevant information in real time, allowing operational issues to be resolved before downtime occurs. Open standards such as IEC 61850 and Profibus/Profinet allows a seamless view of the complete electrical system including high, medium and low voltage equipment. Voice and video enabled communication is integrated in System 800xA via our Extended Operator Workplace. The 800xA High Integrity safety system is TUV certified for SIL3 and was designed with a flexible architecture, in a single configuration. 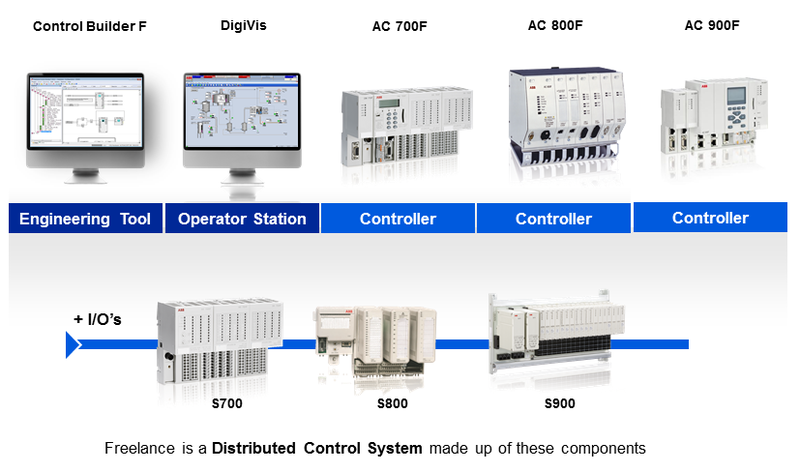 It can be fully integrated with System 800xA, installed on a separate network from 800xA, process control and safety can be combined in the same controller and it can be installed independently and interfaced with any other DCS or HMI. 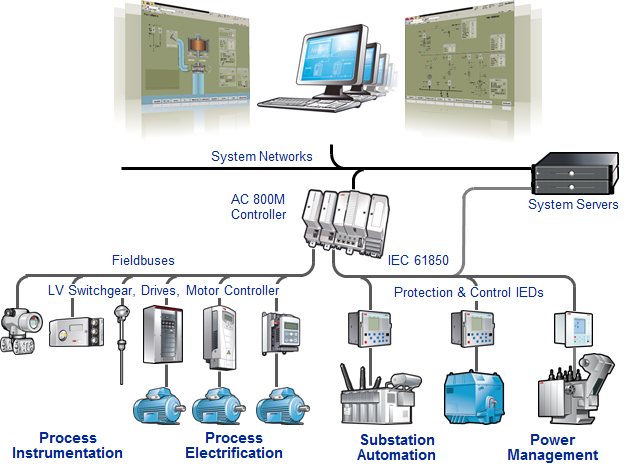 System 800xA offers plant-wide, real-time condition monitoring of all types of critical assets. By assigning asset diagnostic and maintenance data to any object in the system, 800xA presents an end-to-end, overall view of plant assets to allow operations and maintenance staff to increase asset availability and performance. When all assets are running at optimum health, maintenance costs are kept to a minimum. A close collaboration between operations and maintenance creates a streamlined overall workflow where data from disparate systems such as third-party systems and Computerized Maintenance Management System (CMMS) are communicated and shared to all stakeholders throughout the enterprise – from production, maintenance to management. Collaborative Production Management (CPM) solutions integrate all manufacturing systems, providing real-time visibility, execution, tracking, reporting, and optimizing of manufacturing processes. This results in decreased costs through better production scheduling, execution, and management and can even increase revenues through improved customer service and product quality. The cpmPlus Smart Client is a true thin client that seamlessly retrieves data from ABB's System 800xA and connected third-party systems. From exploring, extracting, reefing, and generating to distribution to an end customer, all organizations of must navigate complex regulatory environments and manage extensive operational networks, aging assets, and workforces. Ventyx delivers proven solutions that help control costs while maintaining quality, safety, and reliability to meet essential needs. It creates a natural extension to your 800xA system. Today's manager needs to know how the plant and business is performing. System 800xA provides seamless integration to your SAP or MAXIMO system, helping both operations and management to access necessary information easily in a single environment. ABB's control system simulator provides you with a better way to train operators and test control engineering in a realistic and safe environment. 800xA Simulator enables you to create a full simulatation of your 800xA system.